I have written a lot in my previous essays about the Baku-Ceyhan and the Baku-Supsa pipelines (white lines on the map), as the only American success in the Caspian Sea region, a region which is controlled by the Russians and the Iranians. With the help of the only NATO friendly country of the Caspian Sea, Azerbaijan, the Americans managed to construct a pipeline that bypassed both Iran and Russia, using the energy corridor Azerbaijan-Georgia-Turkey, transferring Caspian energy to the Mediterranean Sea (Ceyhan) and to the Black Sea (Supsa). They did so, in order to provide the European markets with an alternative to the Russian energy, thus decreasing the Russian influence over Europe, hoping that eventually they would manage to influence some of the other corrupted dictators of the Caspian countries too, who are currently under Russian influence, since Azerbaijan’s energy reserves are clearly inadequate to compete with the Russian ones. At the following table you can see the Caspian region reserves by country. As you can see at the above table, the Americans and the Europeans need the oil rich Kazakhstan in order to fill their oil pipelines, and they need the natural gas rich Turkmenistan in order to fill their future natural gas pipelines, if they finally develop a natural gas pipeline network. Alternatively they can take Iran on their side, since Iran is twice as rich as Russia in terms of oil, and its natural gas reserves amount to 2/3 of the Russian ones, and therefore Iran can clearly compete with Russia. 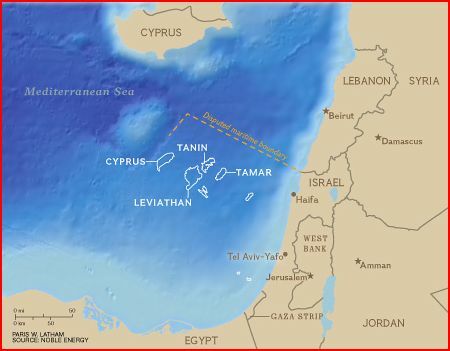 Moreover they planned to construct a new underwater four leg pipeline from Ceyhan to Haifa, which would carry crude oil, natural gas, electricity and water from Turkey to Israel, which would distribute it in the whole region, but also to the port of Eilat and then to South Asia, again bypassing Iran (red line on the map). You can read about the Ceyhan-Haifa pipeline at the above European Commission link, pages 10 and 11, tables 3.2.3 and 3.2.7, or you can see it visually at the following map. Also note that the rich in oil Kirkuk in North Iraq (Iraqi Kurdistan), is also connected to the Turkish port of Ceyhan, with the pipeline Kirkuk-Ceyhan (yellow line on the map). Therefore the underwater Ceyhan-Haifa connection would actually be a connection of Baku and Kirkuk with the Israeli port of Eilat in the Red Sea, and finally to South Asia (Pakistan, India, China) bypassing Iran. 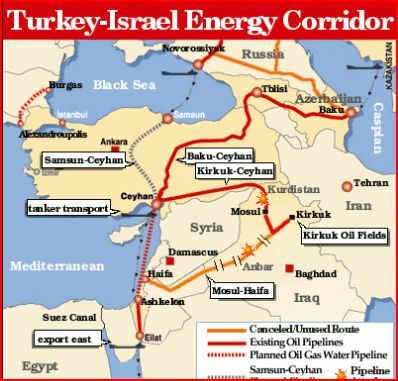 After describing the Ceyhan pipelines and before turning to the Israel-Lebanon War of 2006, I must also say a few words about the economic and geopolitical implications of these pipelines. An obvious consequence of the Baku-Ceyhan, Baku-Supsa pipelines was that the Russians were very angry, since the Americans and the Europeans could compete with them in Europe if they finally manage to reach countries rich in oil and natural gas. Another consequence was that Iran was even angrier than Russia, since the Baku-Eilat pipeline would transfer Caspian energy to South East Asia bypassing Iran. As you can see on the map, the shortest way to provide Caspian Energy to South Asia is through Iran. However with the Baku-Ceyhan and the Ceyhan-Haifa-Eilat pipelines, another financially viable route was created, in order to provide Caspian energy to South Asia bypassing Iran, since for most of the distance (Baku-Eilat) only pipelines would be used, which is a very efficient way of transferring energy, and tankers would only be used from the port of Eilat. This was of course very bad for Iran’s exports, but also for its geopolitical significance. I have said many times in the past how important it is for Iran to construct a pipeline network that would connect it to Pakistan, India and finally China (black line on the map), since it would make Iran much more competitive than Saudi Arabia, its main competitor in oil markets, and Qatar, its main competitor in natural gas markets, since as you can see on the map, Saudi Arabia and Qatar cannot be connected to South Asia with a pipeline network. Geographically it is only possible for Iran to do so. For a detailed description on the war against Iran, in order to prevent it from connecting itself through pipelines to Pakistan, India and China, see my previous essays. Therefore the Saudis and the Qataris do not want a pipeline connection between Iran, Pakistan, India and China, since it would make Iran more competitive in these markets which are currently dominated by the Saudis in oil sales and by the Qataris in natural gas sales. Moreover the Americans do not want this to happens, since it would connect China to the Persian Gulf, and it would enable China to obtain Persian Gulf energy bypassing the Indian Ocean which is dominated by the American Navy, which makes it possible for the Americans to ‘unplug’ China very easily in the case of a war. China partially fixed this weakness with the 400 billion dollar mammoth deal with Russia, according to which Russia will supply China with natural gas for the next 30 years. The Indians, who are a key connection between Iran and China, do not want to be so heavily dependent for their energy imports on the politically unstable Persian Gulf, since there is always the possibility of a ‘hot’ war, which would prevent access to the Persian Gulf and to energy supplies. They have therefore been constantly looking for the past years for a competitive alternative to the Persian Gulf energy supply. Moreover having access to many energy sources is not only good in terms of energy security, but it also ensures better energy prices. For Indians the Iran-Pakistan-India-China pipeline was one of the Persian Gulf alternatives, since even if access to the Persian Gulf by sea was prevented due to a war, supply could continue through the pipelines, and they have therefore many times in the past tried to promote this project, without however so far being successful. On the other hand this pipeline would pass through Pakistan, India’s main enemy, and it had its own weakness in terms of energy security. Therefore the Baku-Eilat connection would offer India an alternative to the Persian Gulf, which would have nothing to do with Pakistan. The following Asia Times article calls the Ceyhan-Eilat pipeline a ‘lifeline’ for India, since it is an alternative to the Persian Gulf and at the same time it is a source of energy independent from Pakistan. You can also read about how important the Ceyhan-Eilat pipeline would be for India in the following Times of India article. This is one more article on the subject from Pakistan Defence, but you can find many other articles if you simply google ‘Ceyhan-Haifa Pipeline and India’ or something similar. Therefore the Baku-Eilat pipeline would not only bypass Iran, but it would reduce the pressure on the part of the South Asian countries for promoting the badly needed for Iran project of the Iran-Pakistan-India-China pipeline. Could it be worse for Iran? That’s why Saudi Arabia and Qatar did not object to the Ceyhan-Eilat connection, because they realize that if the South Asian countries do not have an alternative to the Persian Gulf, they will press harder for a land connection with Iran. The Saudis and the Qataris can compete with oil and natural gas flowing from Eilat to South Asia, but they cannot compete with oil and natural gas flowing from Iran to South Asia through pipelines. After this large introduction I can finally turn to the Israel-Lebanon War of 2006. As you can read at section ‘Inauguration’ of the following Wikipedia link, the Baku-Ceyhan pipeline, it was inaugurated at its Ceyhan terminal on 13.7.2006. As you can read at the following Wikipedia link on 12.7.2006, one day before the Ceyhan inauguration, Hezbollah terrorists attacked the Israelis starting the 2006 Israel-Lebanon War. ‘The Arab League has called Hezbollah’s attacks on Israel “unexpected, inappropriate, and irresponsible acts,” in the words of Saudi Arabia’s foreign minister, PrinceSaud Al-Faisal. The Arab League says they have “fears of widening of tension and possible Israeli strike against Syria,“ “It’s up to the resistance — both the Lebanese and the Palestinian — to decide what they are doing and why are they fighting. Following a meeting of Arab League foreign ministers in Cairo on 16 July, Secretary-General Amr Moussa declared that “The Middle East process is dead” and that “The only way to revive the peace process is to take it back to the Security Council’. ‘Following the Zar’it-Shtula incident, the United States government condemned what it called Hezbollah’s “unprovoked act of terrorism”, and called for the “immediate and unconditional release” of the soldiers. The United States rushed a delivery of satellite and laser-guided bombs to Israel, at Israel’s request. The shipment was not publicly announced. At section Iraq of the following Wikipedia link you will read that Iraq condemned the Israelis. Even though the pipelines were good for Iraq, since Iraq could export its oil to South Asia bypassing Iran, Iraq condemned Israel. The reason is that after the fall of Saddam Hussein in 2003, an Iraq had a Shiite governemnt, and even though it was pro-American, it was very closely cooperating with the Shiites of Iran, and Iraq did not feel that there was any need to bypass its ally. At section Russia of the following Wikipedia link you will read that Russia condemned the Israelis. However for the Russians things were more complicated than the Iranians, because the Russians were of course against the Baku-Ceyhan pipeline, but I do not think that they were against the Ceyhan-Haifa four leg pipeline, since Russia and Turkey are very well connect with pipeline networks, because Russia is the main natural gas supplier of Turkey, and Russia could use the Ceyhan-Haifa pipeline to sell its own natural gas. 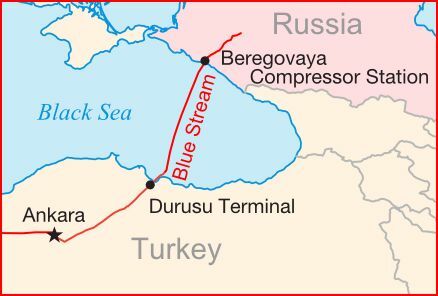 There is already the Blue Stream natural gas pipeline that connects Russia and Turkey under the Black Sea, and they are planning the construction of the Blue Stream 2 pipeline, that would connect Samsun to Ceyhan as you can see on the following 2 maps. Therefore the Russians could sell to the whole region their natural gas through the route Samsun-Ceyhan and Ceyhan-Haifa. However this is back in 2006, and the problems in the American-Israeli relations are not present yet nor is the Israel-Russia rapprochement, and therefore the Russians have to support their traditional allies i.e. Syria, Iran and Lebanon. It is therefore quite simple to explain the Middle East wars if you look at the oil and natural gas that is always hidden in the background of these wars. 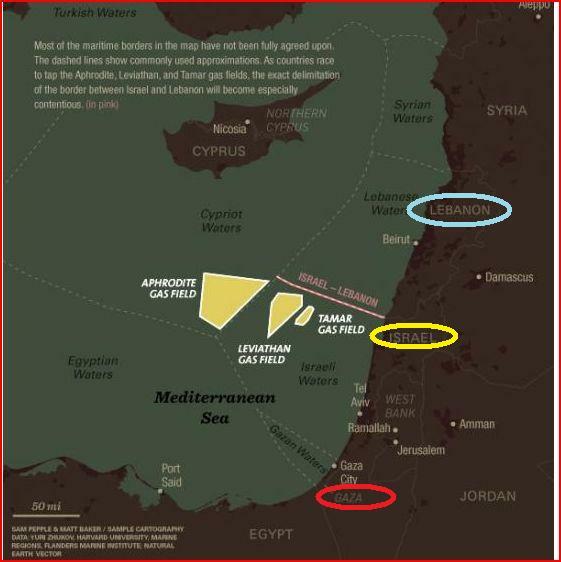 However the Israelis have some problems of their own with Lebanon, since their natural gas supplies are near the Israeli-Lebanese borders, and the Lebanese claim that a part of these natural gas reserves belong to them as you can see at the following two maps. Therefore the Israelis and the Lebanese, besides all the disputes I have mentioned so far, have the natural gas disputes too. However it is mainly Iran that owns Hezbollah, since it is Iran that provides for Hezbollah funding and weapons, and it is on Iran’s orders that Hezbollah acts. Iran has done with Hezbollah, what Qatar has done in Gaza with Hamas. Qatar owns Hamas. It provides its funding and weapons and through this funding Hamas managed to provide financial support to the people of Gaza and won the elections in 2006, and did not conduct other elections since that time. Therefore in the same way that Iran bought Hezbollah at the northern border of Israel, Qatar bought Hamas at the Southern borders of Israel (Gaza). For the relationship between Qatar and Hamas and Iran and Hezbollah you can simply google ‘Qatar Hamas’ and ‘Iran Hezbollah’ to find hundreds of articles. The main dispute between Israel, Hamas and Hezbollah is natural gas. 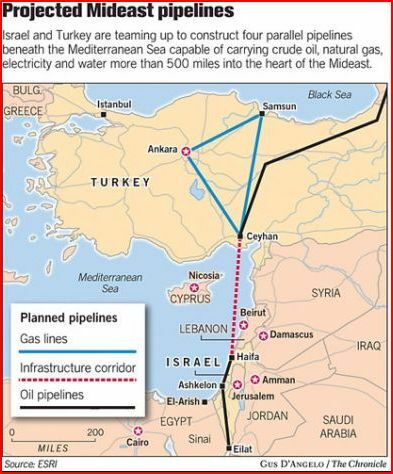 Israel is trying to provide an alternative source of natural gas to Europe, either through Cyprus and Greece or by liquefying its natural gas and exporting it with ships. Iran and Qatar are the 2nd and 3rd richest countries in the world in terms of natural gas reserves, and Israel is closer to Europe and would provide a cheaper alternative even though it has far less reserves, and why not in Africa too. Recently I wrote an essay about the 15 billion dollar natural gas agreement between Israel and Jordan. Therefore even though the Shiite Muslims of Iran and the Sunni Muslims of Qatar are the 2nd and 3rd richest countries in the world in natural gas reserves, and therefore hate each other as we can see with the war in Syria and Iraq now, they both do not want Israel to provide an alternative to the natural gas markets of Europe and Africa, with the help of other Mediterranean countries too, like Egypt, Greece and Cyprus. This is the reason Qatar is pushing so hard for the Muslim Brotherhood to come back to power in Egypt, since the Brotherhood is under its influence. With the Muslim Brotherhood in power Qatar could ensure that Egypt would not undercut its prices. 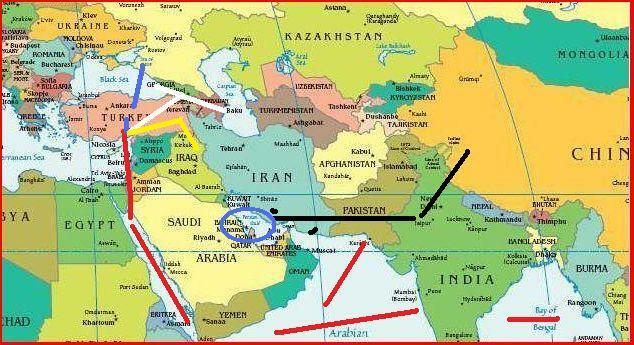 Therefore in the same way that Iran bought Hezbollah at the Israeli-Lebanese borders (black circle in the following map), Qatar bought Hams in Gaza (blue circle), and in the same way the Sunni Muslim terrorists of Hamas take orders from Qatar and Turkey, the Shiite Muslim terrorists of Hezbollah take orders from Iran. Therefore Qatar and Iran can use Hamas and Hezbollah to launce energy wars on Israel whenever they want. As you can read at the following article, Hamas and Hezbollah had very good relations, until the great war between the Sunni Muslims of Saudi Arabia and Qatar and the Shiite Muslims of Iran and Iran broke out, as I was saying in my essay ‘The Energy War Between U.S.A. and Russia’. Therefore it can be seen that the Israel-Lebanon War of 2006 was another hot energy war, in the sequence of the hot and cold energy wars taking place in the Middle East for the last one hundred years. Any analysis about the wars in the Middle East that is not based on oil and natural gas is always totally inadequate.